She's a comic whose timing and personality have made her one of the most exciting new faces on the scene today, performing for sold-out audiences at major venues across the country. Suzanne Westenhoefer talks candidly and hilariously about real-life topics like traveling, the LPGA (Lesbian Professional Golf Association), her mom, electric vibrating bunny rabbits, and Martina Navratalova. 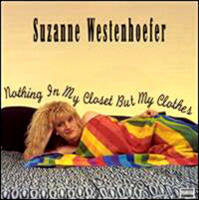 You might say that any performer as out front as Suzanne Westenhoefer is certain to be on the frontline of controversy.